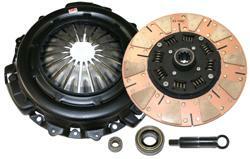 The Competition Clutch Domestic Stage 4 – 2600 Segmented Cerametalic Clutch Kit is the ultimate street strip combination for the enthusiastic road warrior and weekend racer. This assembly delivers increased torque capacity of 80-100% while maintaining reasonably smooth engagement. This is accomplished by maintaining a Marcel wafer and a sprung hub and utilizing a segmented cerametailic friction material on both sides.